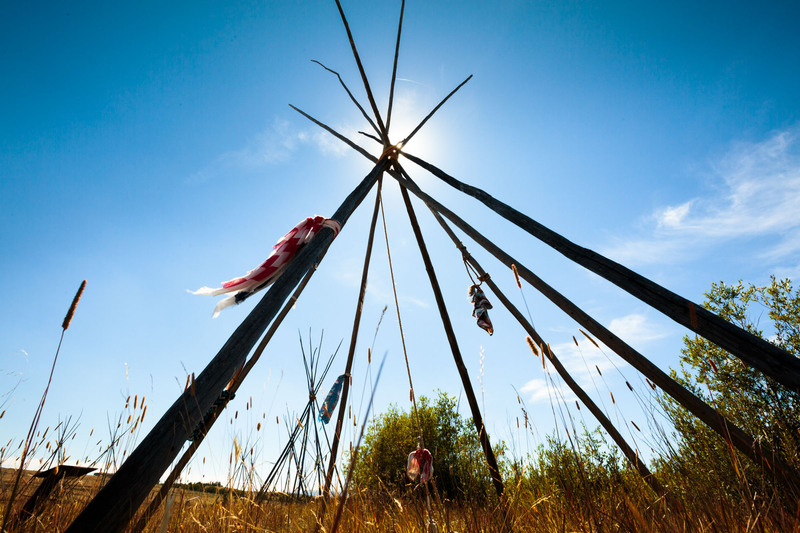 A tattered American flag on Chief Josheph's replica tepee blows in the wind at the Big Hole National Battlefield, Montana. On August 9, 1877, 162 men of the 7th U.S. Infantry and Montana volunteers, made an early morning attack on a sleeping Nez Perce camp at this spot in the Big Hole Valley as a part of an ongoing attempt to forcibly relocate the tribe to a reservation in Idaho. Not suspecting a secondary force, Looking Glass neglected to post lookouts. Though the Nez Perce eventually "won" the brutal battle from a military stand point, counterattacking, seizing and dismantling a 12-pound howitzer artillery, and pinning down the U.S. troops for nearly 24 hours before escaping. It was at a heavy loss of 60-90 dead, only 30 of whom were warriors, the rest women and children. U.S. Military losses were high too, at 29, roughly 1/3 of the regiment.